Happy Bloggers Challenge Friday! Thanks to those who played along with the Fall Colors Challenge, there were many fabulous projects! The challenge this week is Black and White with a Splash of Color (neutrals as needed are okay). 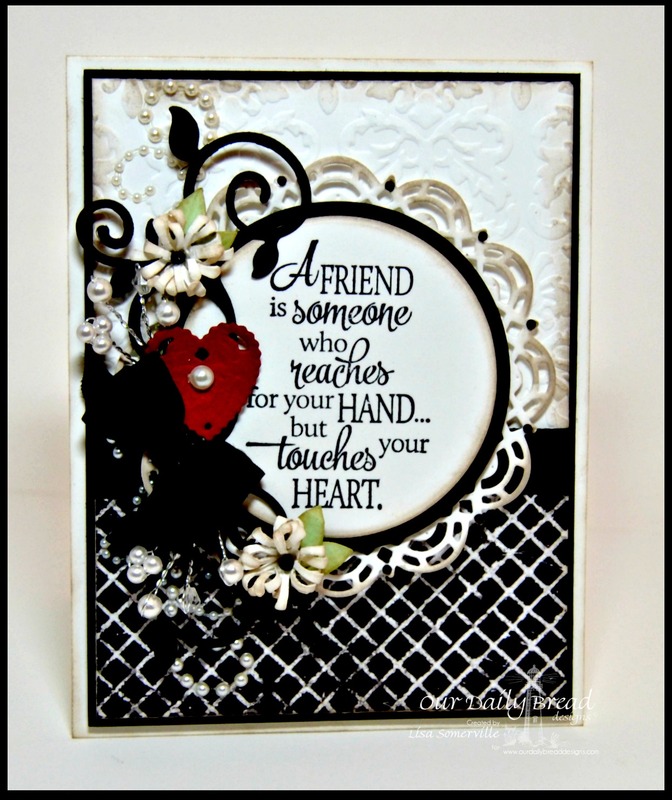 My card uses stamps, custom dies and a paper pad collection from Our Daily Bread Designs. My color splash is the Red heart. I stamped the sentiment from Quote Collection 4 in Black on white card stock, cutting the panel with the ODBD Custom Circle Ornaments Die, layering on a Black Circle panel, then onto the doily that was cut from White card stock using the ODBD Custom Doily Dies. The pattern paper is from the ODBD Chalkboard Paper Collection. To embellish I added Zva Creative Crystal Gems, Black Seam Binding and die cuts pieces using the ODBD Custom Asters and Leaves Dies, ODBD Custom Fancy Foliage Dies and ODBD Custom Ornate Hearts Dies. If you missed the email from Our Daily Bread Designs, they are running a Grab Bag Promotion through Saturday, September 26 2014, click here for more details. Beautiful! Love the elegant doily framing the sentiment panel. Very elegant. There is really something about a black and white card with a splash of red.